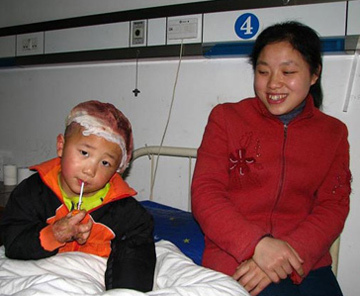 As a toddler, Shen Xizhi lost the use of both of his hands when they were scalded by boiling water and became severely contracted and conglutinated with his arms. Xizhi received reconstructive surgeries at JianShe Hospital in Changsha and rehabilitation to allow him to use his hands normally again. Xizhi is now fully functional, making friends and playing normally with other children.